AdvisePoint Computer Services has merged with Orange County Computer® to bring the best of both worlds to its customers. Both companies working together as one will bring full IT services to businesses and fast professional repair services to both SMB and residential clients with competitive rates. 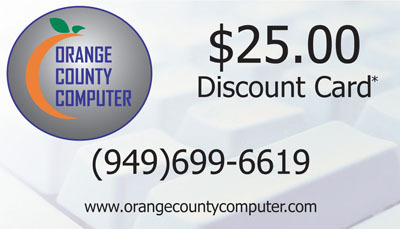 The combined companies will operate under the 12 year established Orange County Computer® name, which has a well known and well respected name in the IT industry for providing excellent service for its clients. Current AdvisePoint customers can download a special $25 off coupon for computer service. Simply print this blog post and bring it in with your system for service to receive your discount. "Coupon is applied toward labor only and cannot be combined with other offers or discounts." ← Why Upgrade to Microsoft Windows Small Business Server 2008?